The Under-18 Girl’s Player of the Year went to Athalia Ibanga of Olympia Cannock HC, whilst the Boy’s award went to Nate Green of Warrington Wolves HC. The Women’s Super-8 Player of the Year was awarded to Denisa Paduraru from Olympia HC whose technical skills and team work helped her side win the England Handball National Cup and a place in Europe. In the Men’s Super-8 category, the clear winner was Zsolt Majoros from Cambridge HC for his tactical insights and 53 goals that helped his team to third place in the league and a spot in the EHF Challenge Cup. 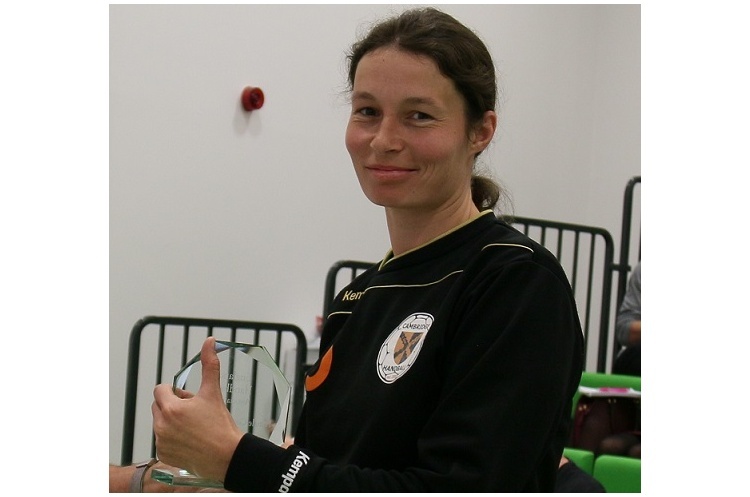 The award for Female Coach-of-the-Year went to Agnes Foeglein from Cambridge Handball Club. The award recognised her work across all levels of her club from the senior teams through to the many junior activities that they undertake. The Male Coach-of-the-Year gong went to Ryan Goodwin from NEM Hawks Handball Club in recognition of his work with the Under-18 Boy’s team, who he led to the title. Goodwin also showed that it is possible to make the transition from player to coach, even at such a young age. It was decided to Volunteer of the Year award should go to two nominees, Jess Persson of Manchester Handball Club, and Kevin Matthews. Jess received the award for her work in developing the coaching structure across Manchester Handball club which has seen a growth from six to 14 individuals over the past year. This has allowed the club to deliver sessions in a number of local schools. Jess has also organised a number of local competitions and works tirelessly to develop the sport in the area. The award was made to Kevin Matthews for his sterling work over many years as team manager with various age-group national teams at English and British levels. His professional approach has helped to ensure that the teams have been able to concentrate their efforts on the court, whilst Kevin takes care of everything off the court. This has all been undertaken in his own time, with the aim of wanting to see handball prosper. The final award of the day, the England Handball Lifetime Achievement Award, was presented to John Jacobson from Liverpool Handball Club in recognition of more than 40 years service to handball. He formed some of the first ever teams in the Merseyside area, and played internationally, including Olympic events. He has also delivered handball to prison inmates and taken the sport to children in deprived inner city areas. It is estimated that he has introduced more than 2000 young people to the sport, with a number going on to gain representative honours with England and Great Britain. He still retains the passion and enthusiasm to this day as he continues to try and develop opportunities for people of all ages and abilities to play handball. England Handball CEO, David Meli, commented: “We are delighted to be able to continue our tradition of recognising the wide range of people involved in our sport. Without individuals like our award winners handball would not function.